The Hyde Park Music Co.
One cultural shift in the United States during the first two decades of the twentieth century was the rise of the modern pop music industry, which created new opportunities for people from the middle- and working-classes to compose and sell their own sheet music. This increase in class diversity within the sheet music industry promoted the circulation of different perspectives in American media; whether on the issue of war, or the portrayal of gender roles in simple songs. This key shift of perspective in music allows us to examine the portrayals and the motivations behind them and analyze if the motivations were for accurate historical depiction or a propagandistic manipulation. Gender stereotypes were culturally diffused through sheet music during the rampant period of violence, industrialization, and media evolution from 1914-1918. There was no shortage of music written by men that depicted women. Their depictions range from a romantic side character, like in “Who’s Your Lady Friend” by Harry Fragson, Worton David, and Bert Lee, to a virginal sister figure in “Sister Susie’s Sewing Shirts for Soldiers” by Herman Darewski, but a common theme throughout most depictions is that women were a support system that men needed to protect. In “Good-bye-ee” by R.P. Weston and Bert Lee, the lyrics, “As the train moved out he said: ‘Remember me to all the girls’ // And then he wagged his paw and went away to war” suggest that women were an important motivator for men to enlist. I posit that depictions of male and female characters in popular song lyrics were a strategy to manipulate men into imagining themselves as heroes so they would enlist. With men leaving for war, the women left became found their own sources of strength, advocacy, and collaboration. World War I was a time in which women acted stronger and more independent than ever, as they were keepers of the nation on the home front. The era of World War I coincided with the suffrage movement, and women founded a host of new organizations in response to the war such as American War Mothers (1917), the Service Star Legion (1919), American Peace Society (1920), and American Legion Auxiliary, which amassed 400,000 members (Cott 1987, 91). Women’s organizations, in an effort to either create peace or military preparedness suggest that women did not need saving because they were prepared to save themselves. 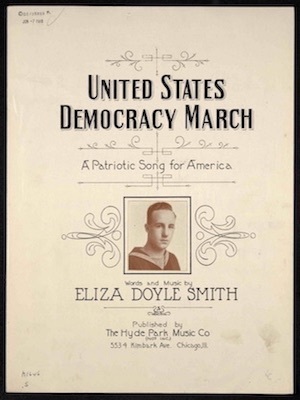 A relevant example of this is a song by Eliza Doyle Smith entitled “United States Democracy March: A Patriotic Song for America.” Smith’s music is notable because she composed the lyrics and music, and did not incorporate gender tropes at all. She allowed her music to stand on its own and provoke patriotism in the country. Music by Eliza Doyle Smith, and other female composers and performers from this time period, highlight women’s reactions and accounts of their role in war that differ from men’s representation of women as subservient and in desperate need of protection. Musical and literary records from the Great War can lead us towards a deeper comparison and analysis of the depiction of gender in American mass media. Whether through journals or books written by men and women during this time period, these primary sources illuminate women’s social evolution in the United States. Bruccoli, Joseph. Great War Collection (University of Virginia). Oh! It's a Lovely War: Songs, Ballads, and Parodies of the Great War. London: EMI Music Publishing, 1978. Early, Frances H. A World Without War: How U.S. Feminists and Pacifists Resisted World War I. Syracuse: Syracuse University Press, 1997. Enloe, Cynthia H. Bananas, Beaches and Bases: Making Feminist Sense of International Politics. Berkeley: University of California Press, 2014. Gavin, Lettie. American Women in World War I: They Also Served. Niwot: University Press of Colorado, 1997. Lubin, David. "Women in Peril.” In Grand Illusions: American Art & the First World War, 17-50. New York: Oxford University Press, 2016. Smith, Eliza Doyle, and Joseph M Bruccoli. "United States Democracy March: A Patriotic Song for America." Chicago: The Hyde Park Music Co, 1918. Watkins, Glenn. “The Yanks Are Coming!” In Proof through the Night: Music and the Great War, 245-269. Berkeley: University of California Press, 2003. 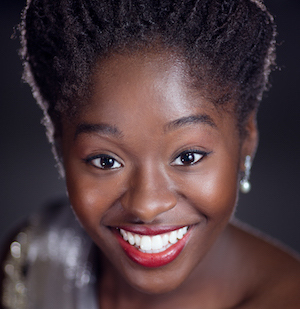 Lauren Maze is a student researcher for the ReSounding the Archives project. She is a second-year student at UVA, studying Environmental Sciences and Media Studies, with a minor in Women, Gender, and Sexuality. Her research focuses on women's roles in World War 1 compositions. Publisher: The Hyde Park Music Co.
For their rights on land and sea. And we’re marching forth again. As our fathers did before. For our right on land and sea. From the dear land of our birth. For the freedom of the earth. We are coming! Millions coming! That our God alone is King.